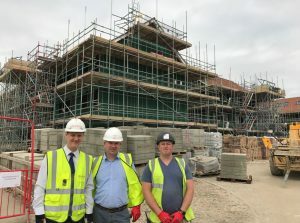 Our Group Managing Director, Garrett Dempsey, is seen here meeting with Chris Collins from Berkeley Homes and Clive Jones from J L O’Rourke at a Berkeley Homes site in the UK. Harmony Timber Solutions and Harmony Timber Frame have been selected for this and other sites for this prestigious national building company. The site is in Sevenoaks in Kent, UK and our combined design and manufacturing plants have been instrumental in the design and supply of the site. The drone shots clearly show the soleplate layouts for the upcoming timber frame buildings as well as showing the traditionally built plots as well. Harmony Timber Solutions have designed and supplied all the roof trusses and Posi joist floors to the site. The images show the various roofscapes that can be achieved using timber roof trusses. A few of the timber frame plots have been fire treated due to the proximity to the existing buildings. This treatment satisfies the requirement for fire safety during construction and therefore reduces the risk during the construction phase. Approximately two thirds of the site is already owner occupied and Harmony Timber is assisting the developer with their Considerate Constructors Scheme. It is great to see the drone shots of the continued construction and amazing to see the speed of progress. We should be receiving further photos and time lapse videos of the construction phase in due course. Harmony Timber Solutions and Harmony Timber Frame are happy to discuss your requirements, big or small, and will work closely with you throughout the whole process.